From Caseville, take M-25 east about 9 miles to Oak Beach Road. Turn right (south) and drive to Loosemore Road. Turn left (east) on Loosemore and continue to the park entrance on the left. 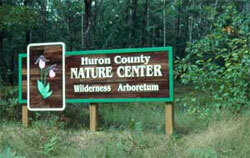 Located less than a mile from the shores of Saginaw Bay, this 280-acre nature center is a wonderful example of undisturbed dune and swale habitat. A network of paved trails snakes atop dry, gently rolling dune ridges and down into shallow, wet depressions known as swales. An interpretive display for the trail system and other educational materials are available at the site. Restrooms and a visitor information board are on site. Camping facilities are planned for the future. This site is home to some very interesting and unique plant communities. The dry, sandy ridges are ruled by jack pine, black oak, and bracken fern—all of which are adapted to living in barren, dry conditions. But down in the moist swales things are different. Mosses, sedges, and red maples dominate here, and these are all plants that like to have their “feet wet.” There aren’t many other places in nature where plants with totally different strategies for surviving can successfully coexist within a few feet of each other. Other interesting plants found here include pink lady’s slipper (see hundreds during the month of May), trailing arbutus, Indian pipes, jack-in-the-pulpit, and wintergreen. In addition to the interesting plant life, look for deer, squirrels, and hognose snakes. The spring warbler migration is also quite good.